That’s not my intention at all. My grandma can draw quite well. My design is to take this drawing app for iOS to the other end of the age spectrum – the kids. That’s the time in our lives we need to go back to if we want to draw with gay abandon, and just find the fun that we lose with adult consciousness. Doodle Buddy is meant to be fun first. A serious drawing application for sketching works of art, second. There’s no binding for the former; the latter needs the little thing called talent. Doodle Buddy is among the flotilla of creative apps that you find for the iOS platform. It includes titles like Procreate, Artrage, FlipBook, or the incredibly creative TypeDrawing. All these are very feature rich, and paid apps. 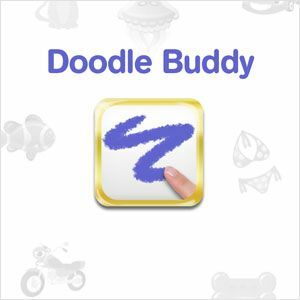 Doodle Buddy is simpler and free. So, can it squeeze a place on your iPad, iPhone, or iPod Touch? A scribble or a masterpiece, both speak for themselves as works of ‘art’. Words can be left aside. So, let me redirect you for a while to Doodle Buddy’s Facebook page. Let me just insert a painting here to give you an idea of what can be done if you know the proper end of a brush…or a finger in the case of Doodle Buddy. Wow-worthy definitely, and all you need is your finger and some imagination. It’s not only about art, because here’s another picture from the Facebook group that shows how you can bring your artwork to the real world. This artist has used her Doodle Buddy paintings on her pen-holder! Well, the above two photos have been teasers. Let’s not get overawed here, and forget that in the end it’s all about fun. As soon as you switch it on, a blank white ‘canvas’ greets you. This is the default background, there are many more which you can select from by clicking on the fourth icon (appears like two photos) from the left. For instance, if you are doodling, you can go for the one that resembles ruled paper. As you can see, the only irritants are the little ads…but hey, even if the app is free, the developer has to earn for his sweat. You can choose the Hide ads option from within Doodle Buddy for $0.99. Using Doodle Buddy is a no-brainer. We go back to the main screen and the four buttons (the fifth is for the settings). The first ‘reverse’ arrow button is for undoing any mistakes you make, and in any drawing app, there are quite few as you well know. The second icon is for the Chalk drawing tool. This is the one, you will be using the most to doodle, sketch, and draw. At least, it’s a personal preference of mine. Then, you can choose to go all arty with the Smudge tool, mixing and matching colors from the color tiles below. 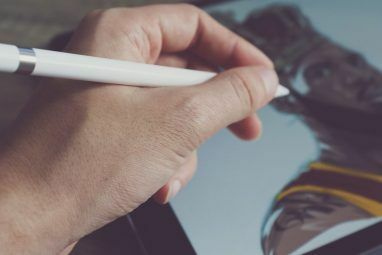 The interface is kid-friendly: it’s easy to understand the purpose of the slider which changes the diameter of the drawing tools. You can also purchase Extras with Doodle Bucks which are then quickly downloaded. Some are “free” like the Color Spectrum, while others can eat up the 170 Doodle Bucks you are given with the install. I have chosen the Color Spectrum and it allows me to choose discrete colors by sliding my fingers across the spectrum. Doodle Bucks are a promotional vehicle for the game developers. 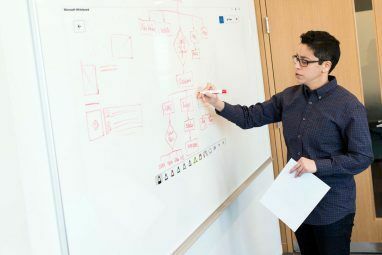 If you want to “earn” more Doodle Bucks, you have to visit a few of their partner sites and see what’s on offer. Stamps and stencils are the fun parts of Doodle Buddy. They are meant to work exactly as their names suggest. There are the default ones and a stamp pack I purchased with my Doodle Bucks credits. With just a tap on the screen, you can imprint any combination in any number. Then there is the Text Tool with resizable text and four fonts. I guess kids of today know what a Wi-Fi network is. Doodle Buddy has a nice little feature which allows you to draw with other friends on the same Wi-Fi network. You can even text chat back and forth with your drawing buddy. I couldn’t try this out for want of a friend, but I trust it works. Not quite. But Doodle Buddy does give you the freedom to draw even if you can’t tell the ends of a brush from each other. Thankfully, in the time I had to try out the drawing app, the ads behaved themselves and didn’t infringe on my canvas. Any grouses? Something to wipe out the entire canvas of my failed attempts maybe, instead of going through multiple undos, using the eraser, or selecting a new canvas. Doodle Buddy is meant to be playful and simple. Is it a candidate for a kid-friendly iPhone or iPod? 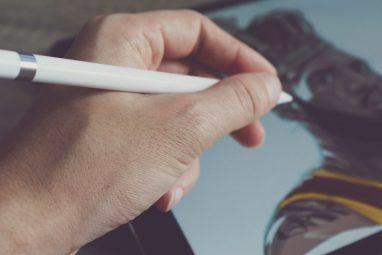 Which is your favorite drawing app for iOS? Enough recommendations and we might put it on our Best iPhone Apps page, where Doodle Buddy also resides.